December 2, 2009 - Delta Air Lines and Nigerian Eagle Airlines today announced they have signed a memorandum of understanding to explore areas of commercial cooperation that will expand travel options between North America and Nigeria. The memorandum of understanding provides for the carriers to discuss marketing agreements that would allow their customers to benefit from frequent flyer program participation and for Nigerian Eagle to place its code on Delta-operated services between Abuja and New York-JFK via Dakar, Senegal. Any codesharing is subject to government approvals. “We are delighted to be exploring a closer relationship with Nigerian Eagle, which will greatly benefit customers in Nigeria,” said Bobby Bryan, Delta’s commercial manager – West and East Africa. Nigerian Eagle Airlines (formerly Virgin Nigeria Airways), is the national flag carrier of Nigeria. The airline operates scheduled regional and domestic passenger services. Its base is Murtala Mohammed International Airport, Lagos. 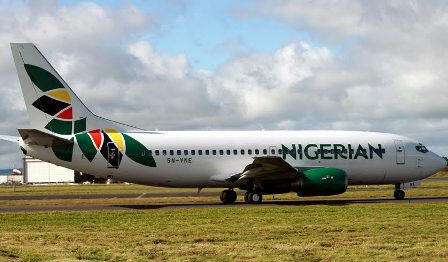 The airline is a replacement for defunct Nigeria Airways. Its registered office is in Ikoyi, Lagos State, while its head office is on the 9th floor of Etiebets Place in Ikeja, Lagos State. The carrier's loyalty program is named 'Eagleflier'. On 28 September 2004, the Nigerian government and Virgin Atlantic Airways signed an agreement to establish a new airline for Nigeria, to be called Virgin Nigeria Airways. Nigerian institutional investors own 51% of the company and Virgin Atlantic Airways owns 49%. The airline's inaugural flight was on 28 June 2005 from Lagos to London Heathrow using an Airbus A340-300 aircraft. Virgin Nigeria has since gone on to become one of Nigeria's largest airlines carrying its 1,000,000th passenger and 4,000th ton of freight within two years of operation. The airline has also received accolades including THISDAY Awards 2006 Airline of the year and a nomination for 2006 African Airline of the year by ASATA (Association of South African Travel Agents). Virgin Nigeria had plans of making Nnamdi Azikiwe International Airport in Abuja its second base where in addition to its Lagos base Murtala Mohammed International Airport it will serve all countries in West Africa. The Nigerian government set a deadline of 30 April 2007 for all airlines operating in the country to re-capitalise or be grounded, in an effort to ensure better services and safety. The airline satisfied the Nigerian Civil Aviation Authority (NCAA)’s criteria in terms of re-capitalization and was re-registered for operation. On 19 August 2008, Virgin Atlantic announced that it was "in talks to sell it's 49 percent stake in Virgin Nigeria". It is also reviewing "whether it is appropriate that the Virgin brand should remain linked to Virgin Nigeria”. The dispute arose after Virgin Nigeria's domestic operations were moved against its will by the Ministry of Transportation to Terminal 2. Virgin Nigeria had twice refused the directive to relocate its domestic operations from the international terminal citing the Memorandum of Mutual Understanding it signed with the previous (Olusegun Obasanjo) administration and pending appeal in a Lagos High court as reasons for not complying. On 9 January 2009, Virgin Nigeria announced they would suspend all long haul flights to London Gatwick Airport and Johannesburg, effective 27 January 2009. Flights have now finished. On 17 September 2009, Virgin Nigeria announced on their website they had rebranded as Nigerian Eagle Airlines. Nigerian Eagle Airlines also stated that they plan to focus on domestic and regional flights with further expansion into Europe and eventually the United States of America. Virgin still own 49% of the new Nigerian Eagle Airlines with the remaining 51% by Nigerian investors.